L'Eau Bleue d'Issey Pour Homme by Issey Miyake is a woody and aromatic fragrance for men. A fresh and forest-green scent, refreshing and relaxing, creative and versatile, perfect for the modern man. The opening is sharp with notes of rosemary, lemongrass, ginger, anise and orange. This only lasts a few seconds before subtle patchouli, juniper berries and a tang of mandarins start to emerge. The base is earthy and as dense as the forest floor with notes of cedar, patchouli, sandalwood and oakmoss. In 2005 L'Eau Bleue d'Issey Pour Homme won the FiFi Award for Best Packaging Men`s Prestige, but don’t be fooled by the sleek blue bottle, this is not an aquatic scent, more of an woody and green fragrance with plenty of patchouli hints thrown in. 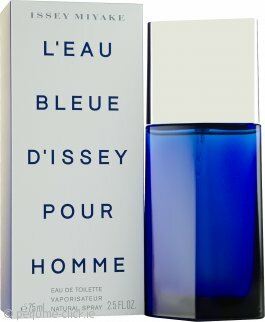 L'Eau Bleue d'Issey Pour Homme was launched by Issey Miyake in 2004. Issey Miyake L'Eau Bleue d'Issey Pour Homme Eau de Toilette 125ml SprayFresh and uncommon. Fresh fragrance with quite uncommon vibe. Starts with wet leafs, woods scent and changes over the time to more woody-cypress notes. Try before You buy since it may be not everyone's cup of tea. Great day and signature fragrance due uncommon notes and all day longevity. Quite impressed with this aftershave. Elegant with a faint minty undertone. Attractive bottle too. Recommended! Wonderfully fresh aftershave, an excellent spring scent. Probably more a daily rather than night wear. Fresh and floral smell, romantic and classic, elegant, great for all year around!! !